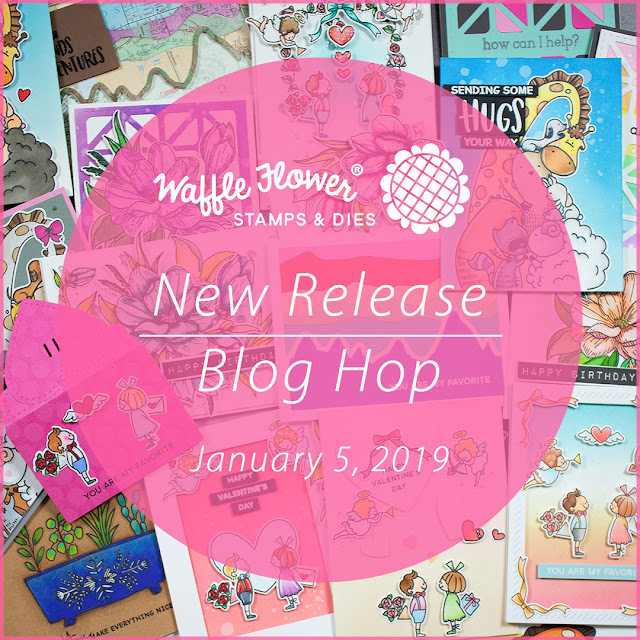 My Cluttered Corner: Waffle Flower January 2019 Release Blog Hop + Giveaway! Great projects. I love how you made the tile pattern look like stained glass. Super cool. Oh, WOW! These are all amazing. My favorites are the gorgeous magnolia ( coloring is beautiful) and the adorable Group Hugs. Great cards! 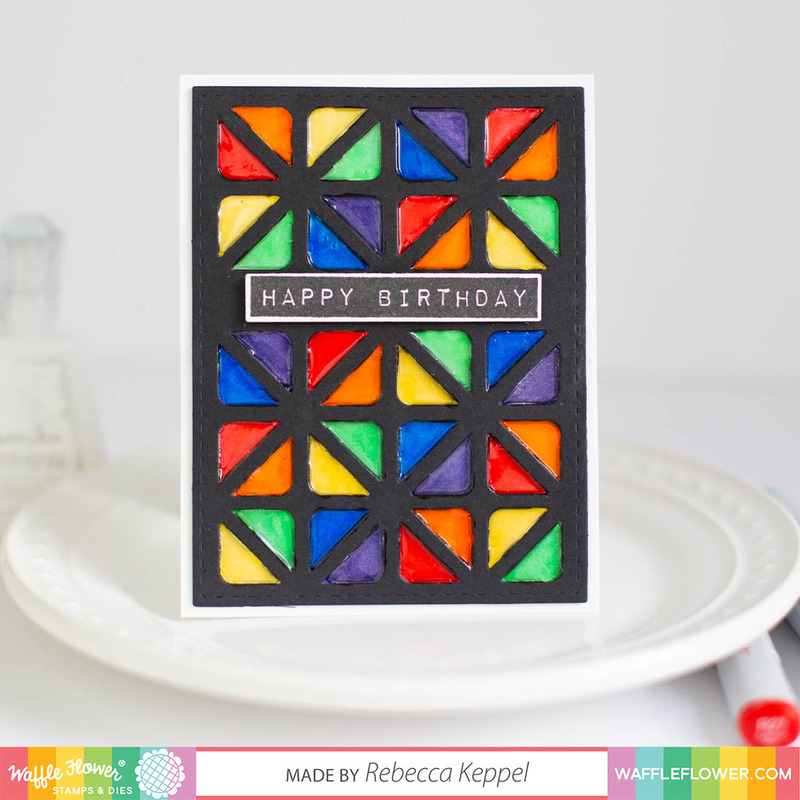 I love your Magnolia card, the coloring is amazing! These cards are adorable. :) I love the one with all the animals on it. They really nailed it in this release , the best since the Wattercolor swatch release ! I love them all �� ! Love it Rebecca ! I love the colors on your cards ! Fabulous ! 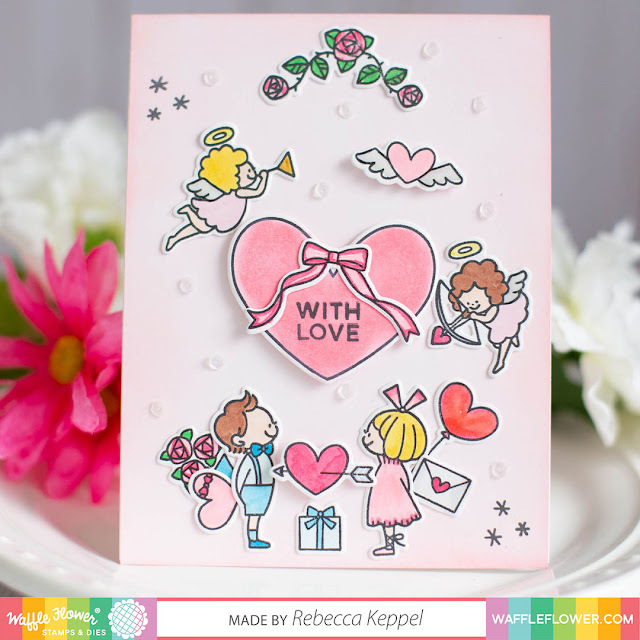 Beautiful cards using these awesome new stamps and dies! Love the new embelishments. I just love everything in this release. the Group Hug set is lovely. Adorable and beautiful cards! Love all the colors. The Happy Birthday card is gorgeous!! I love doing cards like that!! So much fun!! what a great bunch of cards. I really love how you use the different images to create such a variety of beautiful cards. You coloring with Polychromos pencil is so pretty on that Magnolia card! Thanks for sharing all these beautiful samples from the new release, they are all fabulous and no way could I choose a favorite! However, I do think my favorite product from the release is the Magnolia stamp set as I love to color florals. Wonderful cards. 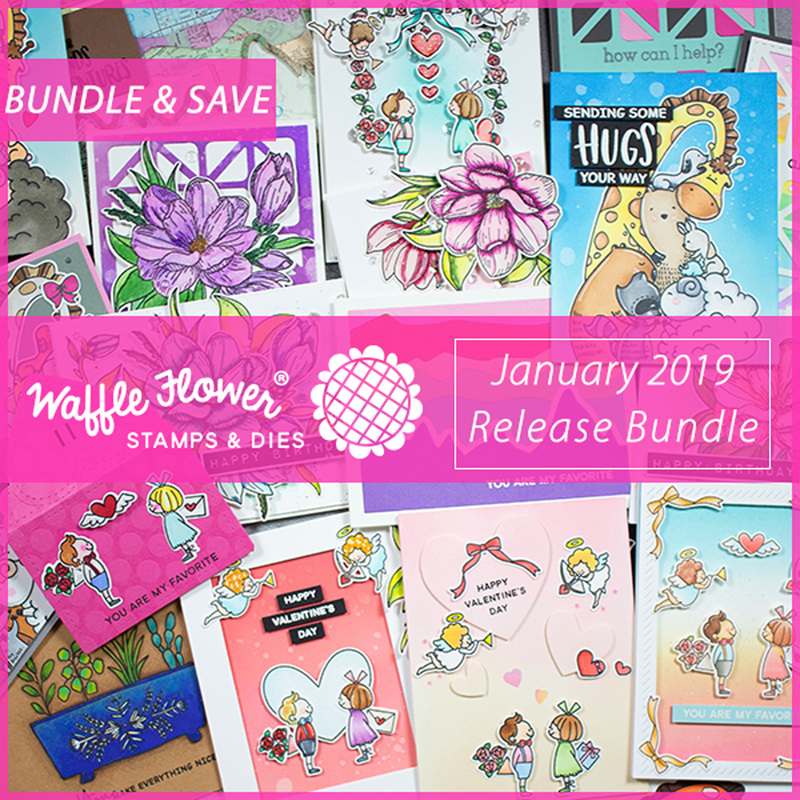 You've used two of my favorites from this release -- Group Hugs and the gorgeous Magnolia. Great release. All of your cards are beautiful! I especially love the Magnolia done in pencil, it looks so pretty against the grey background! Thanks for the inspiration! I LOVE the Group Hug set! You did a great job on all of them! Such great colors! My favorite stamp set is group hugs. The magnolia set is beautiful but I have a lot of floral images. I don't have anything like group hugs. I'm not sure I can pick a favorite among your cards. They all look great. Beautiful cards! I just love the "Group Hug" stamp! 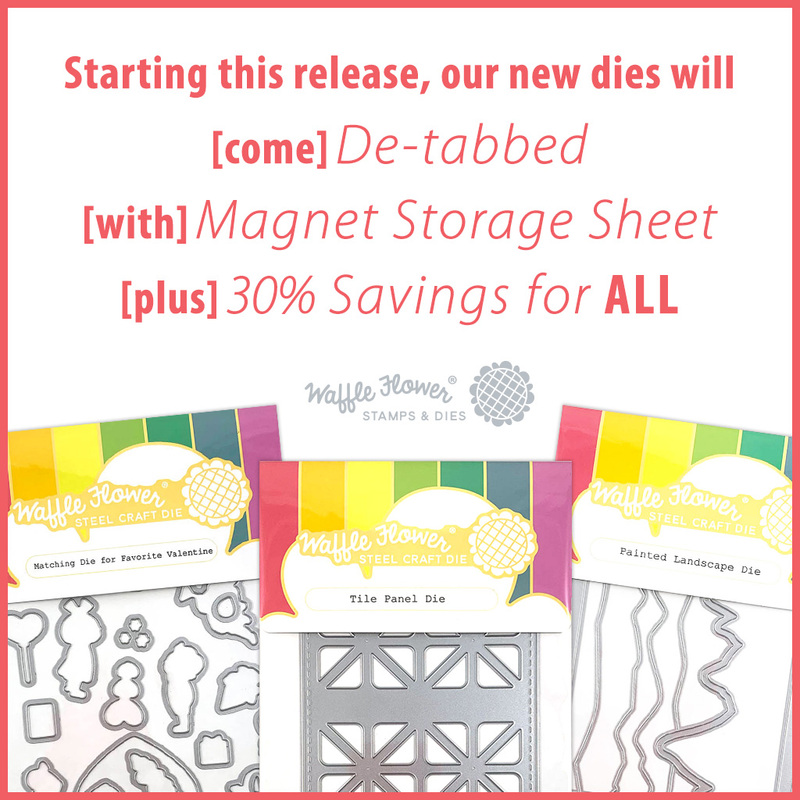 I'm so excited that they are going to start coming de-tabbed and on magnetic sheets. That will save me so much time! Gorgeous cards! Adore the sweet boy and girl in the Favorite Valentine set!! I can see now that I’m going to have to buy that tile panel die. Great cards! All of your cards are lovely. I especially love the coloring on the magnolia card. Thanks for sharing your talent. Wow, you were busy! These are all fabulous, but I think the first one with the beautiful magnolias is my favorite. Your cards so cute! Just love the group hugs card, so sweet. Awesome job, thanks for sharing! Love your "with love" card. Awesome cards! I really love the beautiful Magnolia blooms and the Enamel Dots! So pretty! Favorite Valentine is just adorable! 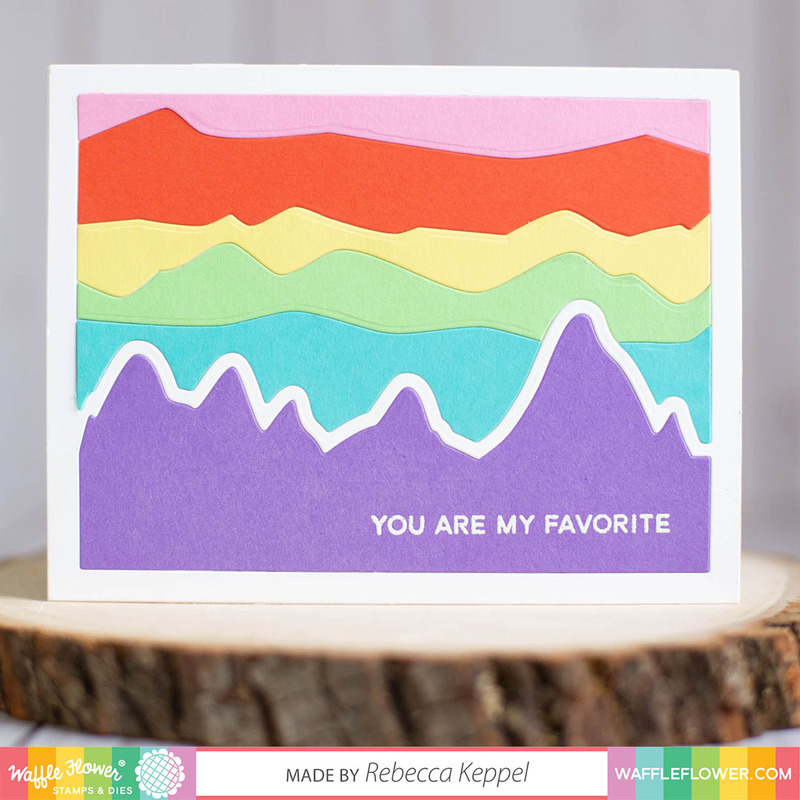 Your Favorite Valentine card is so adorable and I love the landscape die set. Definitely the group hug card and stamp are my faves! Your cards are lovely, thanks for sharing with us. Love this new release and your cards have showcased everything so beautifully! Wow, your cards are amazing. Love the color schemes used. I think these cards are lovely. Love the colors that you chose! Love your adorable cards Rebecca! Love the pastel colors! So beautiful and your coloring is stunning! Beautiful cards. If I had to pick on it would be the giraffes. Fantastic variety and inspiration of the new release! Such beautiful and fun designs - so creative. I love your cards. The giraffe is my favorite! Beautiful coloring on the magnolias! There's so many fantastic designs in this release, but my favorite is the Group Hugs. I also like the new landscape die; it's very different and interesting! Lovely cards! Your coloring is awesome! I can only dream of coloring to that amazing degree! My favorites from this release is Group Hug and the magnolia combo. I see more money coming out of my account, soon, thanks to this new release! Thank you for sharing your creativity with us! I'm totally in love for the beauty and the cuteness of your cards!!! Amazing colouring technique!!! 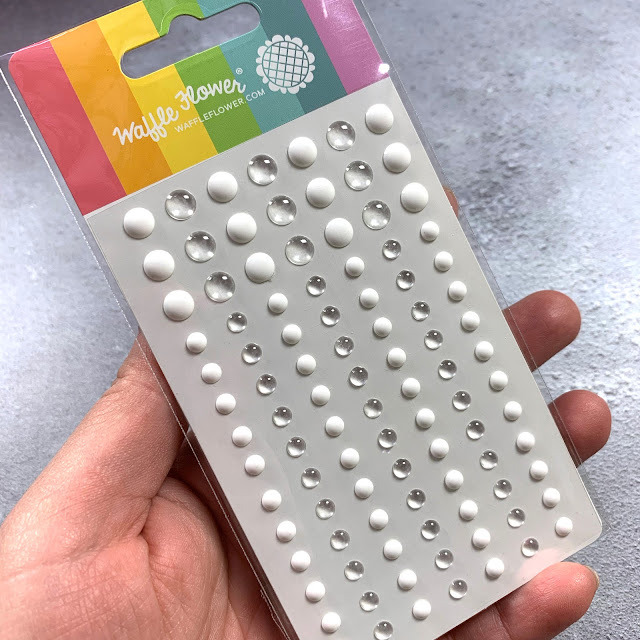 Like how you used the tile panel die! Thanks for sharing! So many fab projects to love! 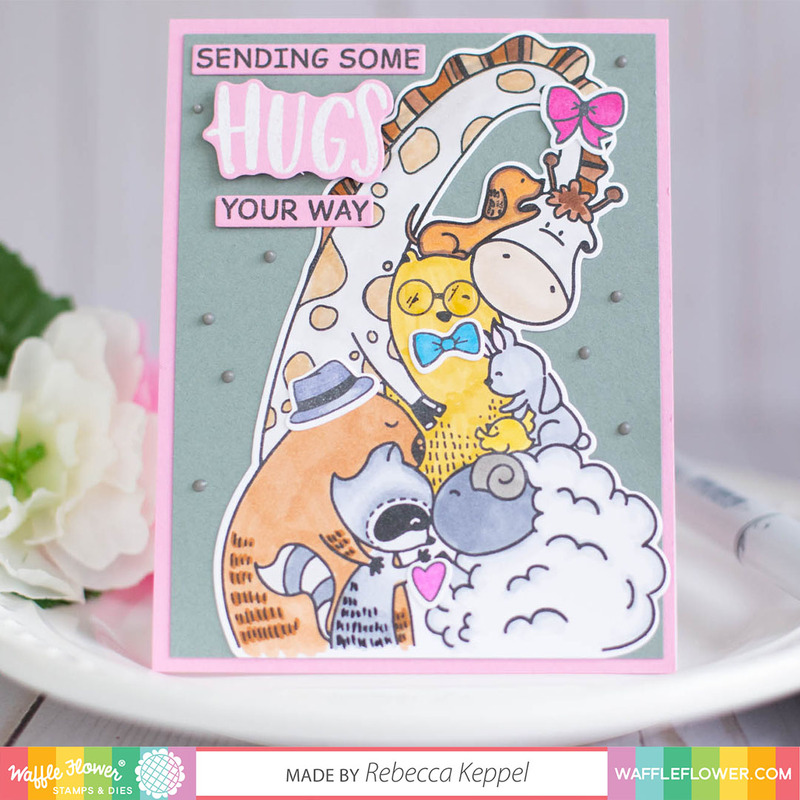 I love that pretty floral card and, of course, the group hug is way too cute! And the cool arsty look of the landscape dies is frameable!! 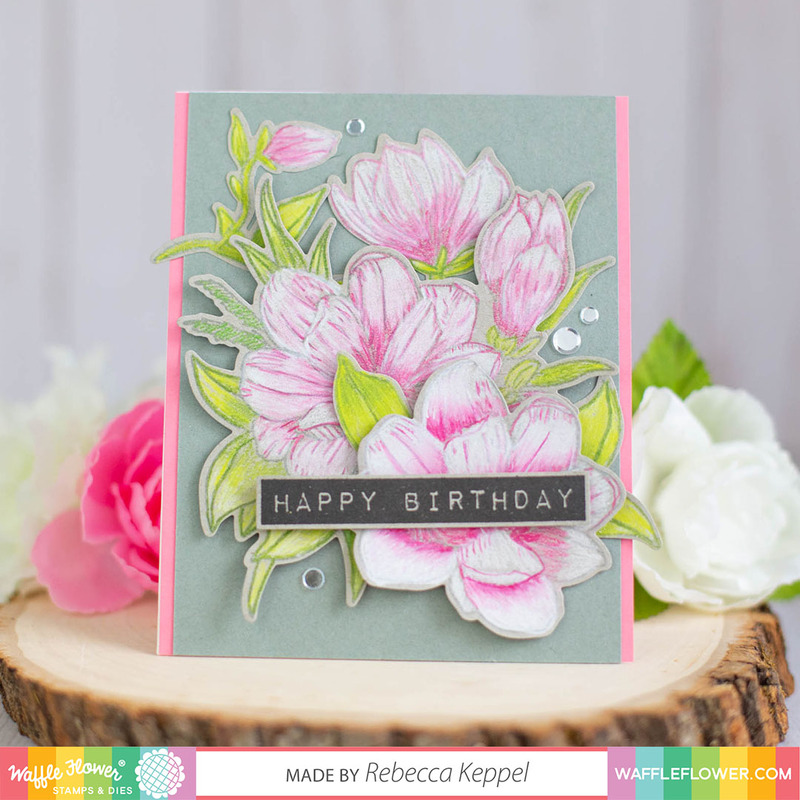 I love the Magnolia set and the soft coloring on your card with the beautiful magnolias! The landscape dies are really fun too, like how you used bright colors. Wonderful! My favorite is the Magnolia card. This whole release knocks it out of the park. I love how you did the stained glass technique; thanks for reminding me about it. And your coloring is just gorgeous; the perfect accompaniment to these great images. Thanks for sharing! This is amazing. I love the stained glass look. It looks amazing. 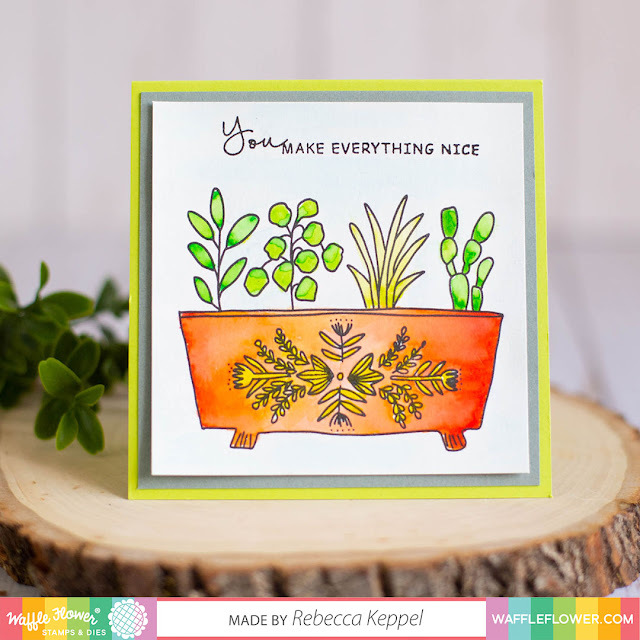 Sweet projects and my favorite is your magnolia card! Gorgeous cards! Magnolia is my favorite flower and you did a beautiful job coloring it, I love it! TFS! Just too cute. Love your coloring too! Loving the new Spice pot and the fact that they come on magnetic sheets! How cool is that!!! Loving those new enamel dots as well, fun! Awesome cards! Love the beautiful Magnolia flowers! The Tile Panel Die is awesome! Thanks for sharing this wonderful variety of cards. My fave is the first one with the Magnolias. Wow! These are fabulous! I love that mountain scene and the colors!